A different twist to the common kebob, this combines spicy sausage and mellow shrimp. In medium bowl, whisk marinade ingredients. 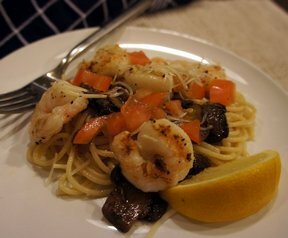 Add shrimp and toss to coat evenly. Cover and refrigerate for 30 minutes. Cut tomatoes in half through the stem or leave whole. Cut sausage into slices approximately 1/4 inch thick. 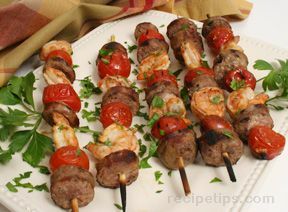 Alternate shrimp, tomato, and sausage on skewers (skewer shrimp through the head and tail so that it won't spin on the kebab). Grill over direct high heat until shrimp are firm to the touch and are turning opaque, approximately 2-4 minutes, turning once during grilling. Transfer skewers to a platter, scatter with parsely, and serve warm.